Betties N Brimstone: Flick the Switch! So who else is obsessed with Etsy? All I know is that I have 36 pages of purchases! Eeek! It is the first place that I go for gifts (for myself and others!). Here is where I found most of the items for Gunnar's nursery, and of course the unusual items I am finding for the wedding. It is just a great site for artists to sell their goods and to possibly get something custom made for yourself. Like I said, I bought items for Gunnar's "Rock and Roll" nursery on Etsy. 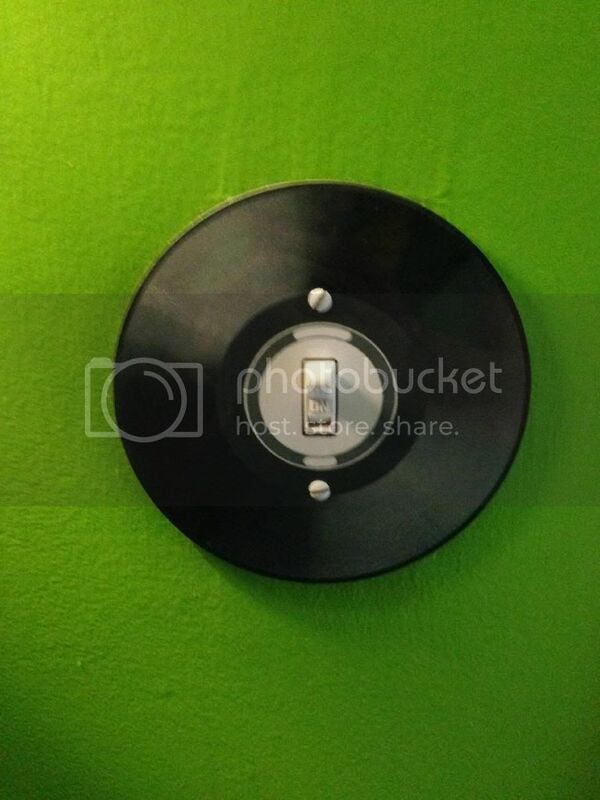 One piece is this fantastic record light switch plate for his bedroom. I always think the little touches complete a room. So when we finally cleared up my "Lady Cave," and got rid of my old futon I knew it was time for a revamp. I will feature pictures of what I do in my "Pyrex Palace" when I am finished, but I want to tell you about the company where I got the record light switch from. They are called Impressions Express. Since the room I am re-doing is so stark white, I thought this was a room that I could put a fun light switch plate in. I headed to their Etsy shop immediately because they gave me such great service with Gunnar's piece. As I was going through all the fun designs I spotted one I liked - a doughnut! The only drawback is that it was a chocolate doughnut, and most of the color in this room was pink. So I messaged them to see if a pink doughnut could be custom made. 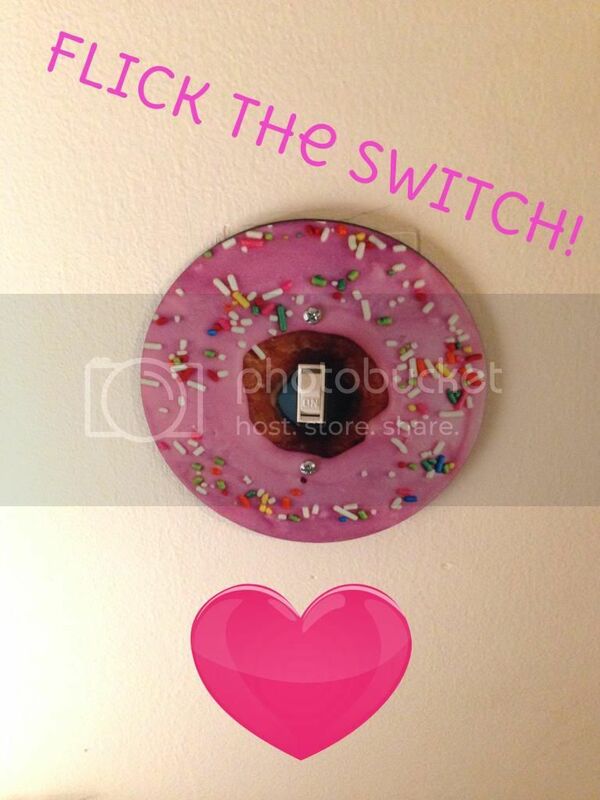 Well, this ended up being a fantastic back and forth messaging of the owner (Robert) searching (and hopefully eating) the perfect pink doughnut for my light switch. He sent me some examples, until we finally found the "one" with just the right amount of sprinkles, and enough doughnut showing... I LOVED his attention to detail! 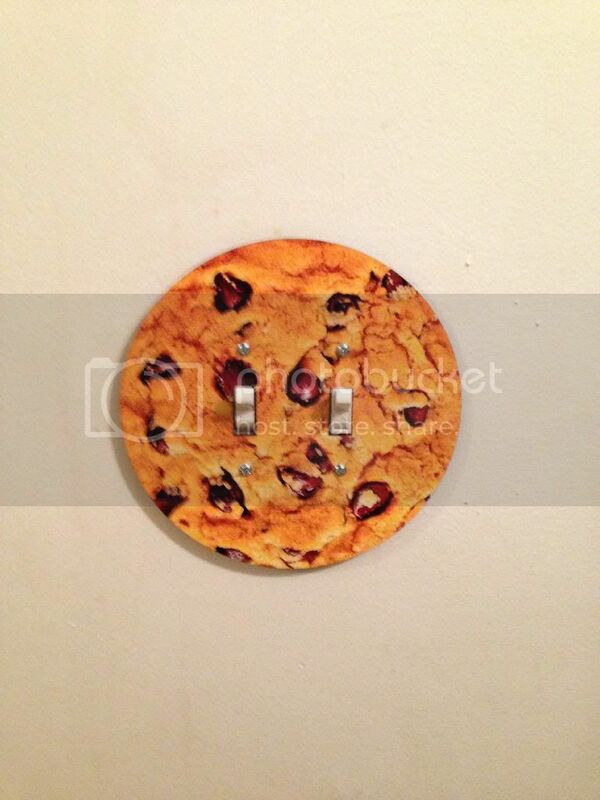 I even was able to consult on other pastry possibilities (which scored me a complimentary light switch). This was one of my favorite transactions on Etsy. They really wanted me to get an awesome piece and gave me fantastic customer service. 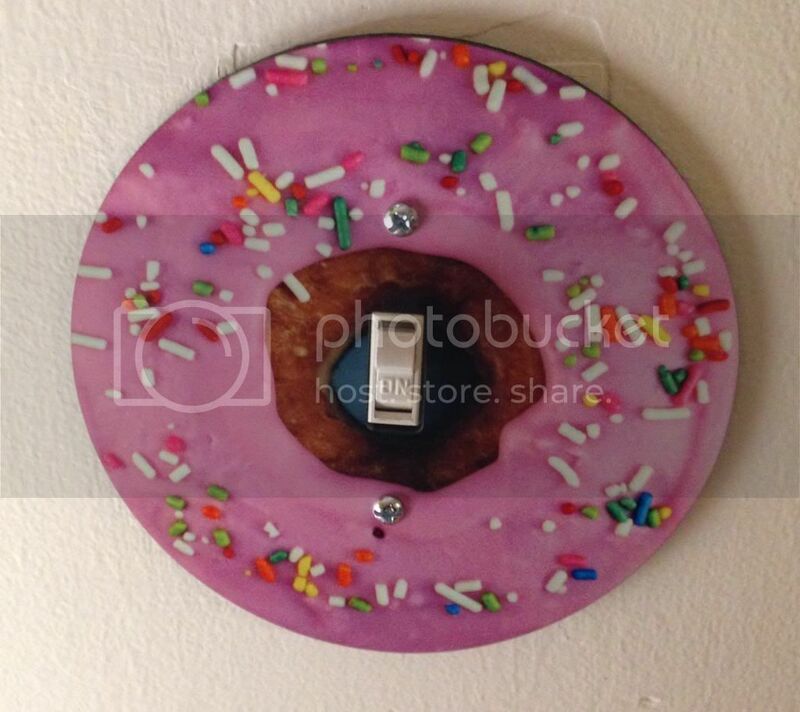 I wanted to thank them by showing their work on the blog because who doesn't need a whimsical light switch cover? They have everything from doughnuts, pizza, chocolate chip cookies and even soccer balls and such. Take a look! "I offer very unique items and designs – many based on round images imprinted onto round items. I deliver speedy service and impressive images including sports, animals, children, flags, flowers, plants, food, drink, football, music, nautical, fine art, chinese, celtic, baseball, basketball, hockey, softball, darts, volleyball, space, soccer, tennis, signs, billiards, textiles, fishing, beach, aviation, poker, coins, and textiles too. Shipping to US addresses is always included in the price." Amazingly, I also received my order in only two days! And, they are offering a 15% off coupon code at check out! Please use coupon code IMPEXP15 for a 15% discount.